Zen practice is sometimes described as the study of the self. This description, in part, arises out of the old story of an interaction between Bodhidharma, Zen's first ancestor in China, and the student who later became his dharma heir, Huike. The story can be found in the koan collection "The Gateless Gate," Case 41. Thus, our earliest Zen role models were engaged in the study of the self, the study of how best to live in a human body and mind. This is the study of what we mean when we say "body and mind." This is the study whose culmination is setting the mind at rest. And when this study yields a result that points to the limits of human conceptual capacity and to the boundlessness of mind, then it begins to show us how we can rest. It's ironic really, particularly when placed in the context of a Western society that highly values the intellect and its capacity for investigation and categorization. Yet, it can be a deeply satisfying experience to come face-to-face with the knowledge that you can't figure something out. That fact is fundamentally a good thing. In order to see it as a good thing, though, a practitioner must have the courage to face the facts and then consider the potential responses. That is, if you encounter the limits of your concept of mind and react in fear or complacency, then you have missed the opportunity it presents. To say that it is enough simply to lead your life whatever way you like, because it is impossible to understand, is also to waste a whole lifetime of opportunities. So what might be a skillful way to study the self? Though one may conquer a thousand times a thousand men in battle, yet she indeed is the noblest victor who conquers herself. The Buddha speaks of conquering one's self, meaning to stop being fooled by one's sense of separation. And what to make of the military reference? For me, it points to the value of courage, perhaps the most important attribute of a warrior. That is, in the study of the self you must have courage - the courage to face the conditions of your life, to face the conditions in the world, to face the nature of suffering and of inconceivability. 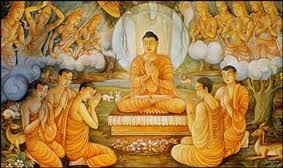 In fact, the great bodhisattvas, enlightening beings, are usually referred to as mahasattvas as well. "Mahasattva" is a Sanskrit word that can be literally translated to mean "great being" but its roots and connotation provide more nuance. The term mahasattva originally referred to the large cats - lions and tigers - as noble, courageous beasts. Later it came to be associated with people who were also noble and courageous. So today I encourage you to have the courage of the big cats. I ask you to consider how you might find the courage to face your life, to face a world which seems to be separate from you. I encourage you to face the desire to separate from the world, and to have the courage not to turn away, but to turn toward it. Study the desire to build a wall and have the courage to step across that divide, toward a self that is incredibly more vast than any wall could contain.